Lady Paget photo album awarded to Archives of Serbia. Serbian Daily Politika reports on a unique photo album which contains 98 photos taken from the First World War, which have until now been unknown to the public. The photos were shot on the war-torn territory of the Kingdom of Serbia and on the battle fronts of the Serbian army. Writer and journalist Nataša Marković presented the album to Dr. Miroslav Perisic, the director of the Archives of Serbia. Nataša Marković is the author of Ledi Pedžet i njeni Srbi (Lady Paget and her Serbs) which was published to mark the centenary of the First World War. I also received the photo album when I promoted the book in Warren House in London, a magnificent Victorian house that once belonged to Lady Paget. So the book did not contain those photos”, said Nataša Marković. The Archives of Serbia received this precious photo album through the mediation of historian Dejan Ristic, an expert on books about Lady Paget, who explained that the album may be small in format but that its historical value was exceptional. “Lady Paget was a great humanitarian, a remarkable woman, an admirer of the Serbs. Her wish was one day to take photos when returning to the homeland. The only place where this album could be kept would be the Archives of Serbia”, said Dejan Ristic. Dr Miroslav Perisic expressed his gratitude for the valuable gifts and announced that in the coming days archivists would work on detailing descriptions of the album content. Lady Paget was an English noblewoman who was remembered by her humanitarian work in Serbia during the Balkan and the First World War. The first time she came to Serbia in 1910 as the wife of British ambassador in Belgrade Ralph Paget. Her humanitarian work was already in effect during the First Balkan War, when they established a military hospital in Belgrade where she worked as a nurse. The outbreak of World War II found Lady Paget in London, whereupon she moved to Skopje, where she worked diligently to care for the wounded and the sick, so much so that she herself ill with typhus. After the withdrawal of Serbian army across Albania, she decided to stay at the hospital in Skopje treating heavy casualties, up to 1916, when she was transferred back to the UK. Many thanks to Britić for this article. Although not a member of the SWH, she worked alongside many of the SWH units in Serbia. She was a remarkable lady and without question a key figure in Serbian ww1 history. Lady Paget is fondly remembered at St Sava’s Church in London. Read more in Politika – click here. Scottish women who volunteered in Serbia during World War One are being commemorated in a series of stamps. The British Embassy has teamed up with Serbia Post to celebrate the efforts of the Scottish heroines. Five women who worked as doctors, nurses and drivers feature on the new stamps. 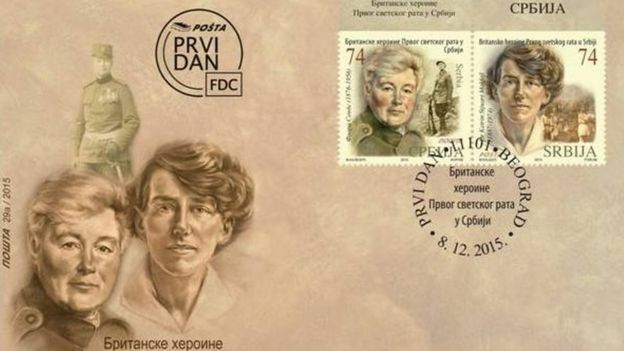 A sixth English woman, Captain Flora Sandes, who was the only British female to bear arms during WW1, is also being remembered. Evelina Haverfield – British suffragette and humanitarian worker. She was the chief administrator of Scottish Women Hospitals in Serbia and set up one of the first local orphanages. Dr Elsie Inglis – campaigner for women’s suffrage and the founder of the Scottish Women Hospitals in Serbia. Dr Inglis was one of the first female graduates at the University of Edinburgh. Dr Elizabeth Ross – one of the first women to obtain a medical degree at the University of Glasgow. She travelled to Serbia as a volunteer and tragically passed away during the typhoid epidemic in 1915. Dr Katherine MacPhail OBE – involved in humanitarian work in Serbia throughout WW1. She is remembered for opening the first paediatric ward in Belgrade in 1921. Dr Isabel Emslie Galloway Hutton – joined the Scottish Women Hospitals as a volunteer in 1915 after she was turned away by the War Office in London. She served in France, Greece and Serbia until 1920. Cpt Sandes went, along with other British nurses, to Serbia in 1914. However, she swapped bandages for guns when she enlisted in the Serbian Army. She remained in Belgrade after WW1 and volunteered to fight the Nazis during the attack on Yugoslavia in April 1941. She was decorated with the highest Serbian military medal for her contribution in combat. 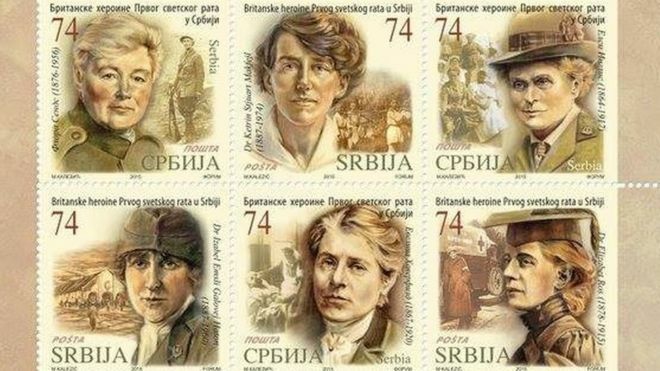 The stamps are part of a wider campaign by the British Embassy in Belgrade aimed at highlighting more than 600 British women who contributed to the war effort in Serbia. As well as remembering their service to the war, the embassy is keen to focus on their role in raising awareness about universal suffrage, solidarity and gender equality and the part they played building relationships with leaders and communities in Serbia.